@Polanskiman, please note I am not asking for tips or tricks to abuse QuickConnect on XPE. I've been working with Synology support and they don't know what the problem could be and I'm curious if it's something that carried over from XPE. Ok, so I've used XPEnology for about 4 years now and have loved it. So much so that I recently bought and migrated to a DS1517+. This thing is great. 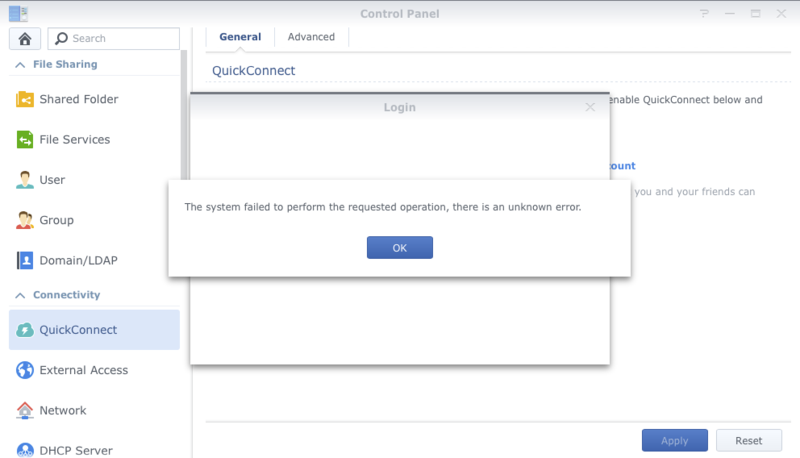 I got excited to use QuickConnect legitimately but quickly found that I am unable to even log in. I get hit with the same screen that many XPE users see, which is, "The system failed to perform the requested operation, there is an unknown error." The control panel has my old QuickConnect ID entered in but grayed out. I cannot edit it and cannot log in. All I get is that error. A similar block is in place for enabling remote access in Support Center->Support Services. If I try to enable it, it immediately disables itself. I'm curious, and hope someone has some insight, if there is a certain file somewhere in the system that carried over during migration that is causing Synology to flag my real DiskStation as a fake. Any help or recommendations are greatly appreciated! Thank you! Is the same Synology account that you use in Xpenology??? Yes, it's the same account, but even if I wanted to change it I can't. I can't get the login/register window to open whatsoever. Also, I use this same account for my DS412+ and it still works with that same account so I'm leaning more toward some file/setting that migrated over from XPE into the real hardware. What a strange idea to migrate from an xpenology to a real synology expecting all to work. If I where you I would do a clean install. Your synology has a real s/n and a real mac address that are specific to that model. It should all then work fine. Your data will not be affected but you will have to reinstall your apps and reconfigure DSM. Strange as it may be it worked wonderfully with the exception of this one small thing (which is no deal breaker). It's mostly just piqued my curiosity to see if anyone was aware of a modification within DSM outside of or carried over from the XPE usb booter. In the meantime I'll post any updates I get as I work with support. If this was a deal breaker I would of course start fresh but I preferred to see if a migration would work (it almost entirely did) and I wanted to retain my app data and customizations from the last four years. Thanks all! I highly recommend you do a clean install. Just out of curiosity: how do you do that without losing all the data in your raid array?. @fjf I have a full backup on my DS412+ so I pulled 5 of my 8 drives and the 1517 booted right up with my login. Logged in with my DSM config in-tact and my array degraded (as it should be). I removed the volume and restored from backup. I am planning on replacing the old drives anyway so if I can't find what's causing this strangeness then I'll be doing a clean install with the new drives anyway. Just thought it was interesting enough to share is all.